$4,690 off MSRP! Sequoia Limited 4D Sport Utility i-Force 5.7L V8 DOHC VVT-i 4WD 6-Speed Automatic Electronic Midnight Black Metallic 3rd row seats: split-bench, 8 Speakers, All Weather Floor Liners, All-Weather Cargo Mat, All-Weather Floor Liner Package, Auto-dimming door mirrors, Auto-dimming Rear-View mirror, Blind spot sensor: Blind Spot Monitor w/Lane Change Assist warning, Brake assist, Distance pacing cruise control: Dynamic Radar Cruise Control (DRCC), Door Sill Protectors, Exterior Parking Camera Rear, Front dual zone A/C, Front fog lights, Front Heated Bucket Seats, Fully automatic headlights, Garage door transmitter: HomeLink, Headlight cleaning, Heated door mirrors, Illuminated entry, Leather Trim Seats, Navigation System, Power moonroof, Radio: Entune Premium Audio with Navigation, Radio: Premium Display Audio w/Nav/Entune/JBL, Remote keyless entry, Safety & Convenience Package, Security system, Speed-sensing steering, Sun blinds, Traction control, Two-Position Power Memory Driver's Seat. 13/17 City/Highway MPG Stop by Peoria Toyota today at 7401 N Allen Rd, Peoria, IL 61614 to schedule a test drive or give us a call at 309-693-7000 to make an appointment. To view all available inventory please visit www.peoriatoyota.com. $4,613 off MSRP! Sequoia Platinum 4D Sport Utility i-Force 5.7L V8 DOHC VVT-i 4WD 6-Speed Automatic Electronic Midnight Black Metallic A/V remote, All Weather Floor Liners, All-Weather Cargo Mat, All-Weather Floor Liner Package, AM/FM radio: SiriusXM, Auto-dimming door mirrors, Auto-dimming Rear-View mirror, Blind spot sensor: Blind Spot Monitor w/Lane Change Assist warning, Brake assist, Door Sill Protectors, Entertainment system, Exterior Parking Camera Rear, Front dual zone A/C, Front fog lights, Front Heated & Ventilated Bucket Seats, Fully automatic headlights, Garage door transmitter: HomeLink, Headlight cleaning, Headphones, Heated door mirrors, Illuminated entry, Memory seat, Navigation System, Power moonroof, Radio: Entune Premium JBL Audio with Navigation, Remote keyless entry, Security system, Speed-sensing steering, Sun blinds, Traction control. 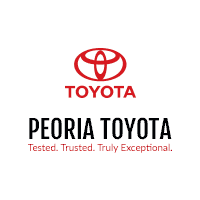 13/17 City/Highway MPG Stop by Peoria Toyota today at 7401 N Allen Rd, Peoria, IL 61614 to schedule a test drive or give us a call at 309-693-7000 to make an appointment. To view all available inventory please visit www.peoriatoyota.com.